Multicystic dysplastic kidney (MCDK) is a form of renal dysplasia characterized by multiple varying sized noncommunicating cysts separated by dysplastic renal tissue, causing the renal function to be minimal or absent. MCDK occurs in one of 4300 live births., Most of the cases are unilateral; occur in isolation, and involute over time. A meta-analysis of 67 studies with approximately 3500 patients found a slight left-sided predominance (53%). 60%–80% of the cases of MCDK are detected antenatally. On the other hand, postnatal detection of MCDK is less common (20%), and it presents with clinical symptoms such as an abdominal mass or urinary tract infections (UTIs). Previously, standard management included nephrectomy of the involved kidney because of concerns regarding hypertension, infection, and malignant transformation. However, recent experience demonstrates spontaneous involution of the dysplastic kidney with a very low incidence of complications. Nevertheless, patients with MCDK are followed up long term with significant financial implications. Renal insufficiency may develop in a small number of patients with MCDK. The aim of this study was to evaluate the clinical course and renal outcomes of patients with antenatal diagnosis of unilateral MCDK born and treated at our institution. In addition, we wished to examine the incidence of associated renal abnormalities in patients with MCDK and assess the value of routine voiding cystourethrogram (VCUG) screening. Patients with antenatally diagnosed MCDK who were born and followed up in our center between January 2010 and December 2015 were reviewed retrospectively. Demographic, clinical, laboratory, and radiological data were evaluated. Age, gender, laterality of the MCDK, serum creatinine, blood urea nitrogen (BUN), history of UTI, results of imaging studies, additional urological anomalies in the urinary system, nonurological anomalies, malignancy, and hypertension were recorded. In addition, involution was identified in the dysplastic kidney. Simple MCDK was defined as unilateral renal dysplasia without additional renal abnormalities. Complex MCDK included patients with unilateral renal dysplasia with other renal abnormalities including vesicoureteric reflux (VUR). MCDK was diagnosed by ultrasound (US), which showed the presence of multiple noncommunicating cysts of various sizes and no evidence of specific renal parenchyma. Dimercaptosuccinic acid (DMSA) renal static scintigraphy scan was done to evaluate the renal function of the affected kidney in all patients. VCUG was performed routinely in all patients to detect associated VUR. In the first 6 months after confirmation of unilateral MCDK, patients were assessed clinically every 3–6 months. Patient features determined visit intervals. The patients with associated anomalies and complicated patients were followed up according to the related protocols. US examinations were performed at 3 and 6 months of age, then patients were followed-up every 6 months for the first 2 years and evaluated yearly thereafter. Both clinical and radiological evaluations were performed. The follow-up consisted of US of the kidneys and the bladder, blood pressure measurements, and blood analysis. Antibiotic prophylaxis was given only to patients with VUR. The disappearance of MCDK on the US was defined as complete involution. Partial involution was defined as size reduction of MCDK on US evaluation. Evidence of increase in the size of the contralateral kidney (compensatory hypertrophy) was also recorded from the initial postnatal USS and the subsequent follow-up scans. VUR was graded according to the international reflux classification on VCUG. Hypertension was defined as systolic and/or diastolic blood pressure >95th percentile for age and gender. UTI was diagnosed as significant bacteriuria (100,000 cfu/ml) in the urinary culture. Descriptive statistics were expressed as mean (standard deviation [SD]), median (range), and numbers (percentages). Comparisons were made between infants with right and left MCDK as well as simple and complex MCDK using the Chi-Square and paired samples t-test as appropriate. P < 0.05 was considered statistically significant. Analyses were performed with the SPSS Statistics for Windows version 22 (SPSS Inc., Chicago, IL, USA). A total of 44 infants with MCDK were born during the study. MCDK was found in the left side 22 infants (50%). All infants were antenatally diagnosed and were followed up locally. The mean gestational age at birth was 37 weeks, and 25 (56.8%) of the infants were males. There were other associated renal abnormalities in 63.6% however; only 6.8% of the infants had other associated extrarenal abnormalities. There was one (2.3%) mortality in our series. This was an infant with unilateral MCDK and associated renal agenesis on the contralateral side [Table 1]. All 44 (100%) infants underwent renal USS imaging after birth at a median age of 2 (range 1–9) days. US scans confirmed the antenatal diagnosis of unilateral MCDK in all infants. In addition, hydronephrosis was diagnosed in 21 on the 44 infants (47.7%). Nearly 43 (98%) of the patients had VCUG screening at the median age of 8 (range 2–49) days. VUR was diagnosed in 7 infants (16%) of the study population. One patient had high-grade VUR (Grade 3), and six patients had low-grade VUR (Grade 2). Forty-three percent of the reflux episodes were contralateral to the dysplastic kidney, 28.5% were ipsilateral to the MCDK, and further 28.5% were bilateral. All patients had spontaneous resolution of the VUR. 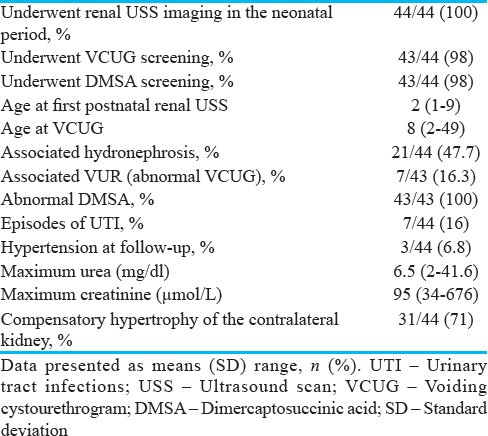 Furthermore, 43 (98%) infants had DMSA scan before maternity unit discharge, which revealed absent/reduced renal function on the affected side [Table 2]. There were no familial cases in our series. The median duration of follow-up was 36 range (12–84) months. UTI were diagnosed in 7 (16%) patients and 3 (6.8%) patients had hypertension requiring medical treatment. All patients with UTI were medically managed and none of them required surgery. Five (71.4%) of the UTI episodes occurred within 2 weeks of the VCUG screening. Follow-up renal US scans confirmed compensatory hypertrophy of the contralateral kidney in 31 (71%) of patients [Table 2]. Complete involution of the dysplastic kidney was seen in 10 (27.7%) of patients whereas partial involution of the dysplastic kidney was seen in 20 (45.5%) patients at follow-up. In 14 patients (31.8%), there were no changes in the size of the dysplastic kidney at follow-up [Table 1]. 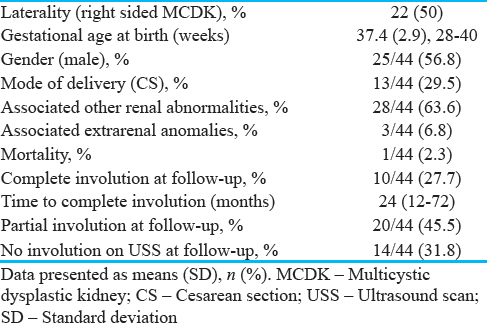 There were no differences in gestational age at birth (P = 0.525), gender (P = 0.112), associated hydronephrosis (P = 0.114), and associated extrarenal anomalies (P = 0.116) between infants with right and left MCDK [Table 3]. Associated VUR (P = 0.527), episodes of UTI (P = 0.50) and hypertension (P = 0.482) did not differ between the two groups [Table 3]. There were no statistically significant differences between patients with right and left MCDK with regard to involution of the dysplastic kidney at follow-up nor the compensatory hypertrophy of the contralateral kidney [Table 3]. There were 28 infants with complex MCDK (associated with other renal abnormalities). Compared to infants with simple MCDK, there were born at an earlier gestation (36.5 vs. 38.8 weeks, P = 0.018). At follow-up, infants with simple MCDK, suffered more episodes of UTI (31% vs. 7%, P = 0.039). Maximum BUN (7.2 vs. 4.8, P = 0.041) and creatinine (110 vs. 69, P = 0.045) were significantly higher in infants with complex MCDK [Table 4]. There were no statistically significant differences between simple and complex MCDK with regard to hypertension at follow-up, involution of the dysplastic kidney, and the compensatory hypertrophy of the contralateral kidney [Table 4]. We have demonstrated that infants with MCDK suffer morbidities at follow-up as evidenced by hypertension and episodes of UTIs. In addition, we have also demonstrated that the risk of UTI is highest in the immediate period following VCUG screening and is neither related to presence nor severity of VUR. We have not observed any differences in the short and long-term outcomes between infants with right and left MCDK. Furthermore, we have demonstrated that patients MCDK associated with other renal abnormalities were born at an earlier gestation and are more likely to have worse renal function as predicted by the highest blood urea and creatinine values. In the literature, unilateral MCDK was seen more often in males (59.2%) and in the left kidney (53.1%). In our study, the majority of patients were male (56.8%) with an equal number of the right and left MSDK. We report compensatory hypertrophy in 71% of our cohort. This is consistent with the findings from another study which reported contralateral hypertrophy in 77% of patients. Others have reported higher rates of compensatory hypertrophy of the contralateral kidney (81%) with longer duration of follow-up than our cohort. In the literature, overall rates of compensatory hypertrophy in patients with MCDK varies from 45.3% to 89.8%.,,,, While the mechanism is unclear, compensatory hypertrophy likely begins in utero and is defined as a renal length > +2 SDs of the mean. Compensatory hypertrophy does not occur in all patients. The absence of compensatory hypertrophy may indicate a pathological condition such as hypoplasia in the contralateral kidney. Abidari et al. observed that, among in 48 patients with MCDK, 18.7% had contralateral kidneys that were actually two SDs below the mean growth curve. We report complete involution of the MSDK in 28% and partial involution 45% of cases at follow up. Data from previous studies showed that the rates of involution at follow-up ranges from 35% to 62%.,, Nevertheless, lower rates of complete involution were reported in the study by Rabelo et al. In that study, patients were followed for a mean of 42 months (range 12–156 months). The study demonstrated complete involution in 19% and partial involution in 70%. Complete involution increases with increasing duration of follow-up from 9.8% at 1 year to 53.5% at 10 years of age. Furthermore, it is more likely to occur in smaller size MSDK. We speculate that the lower rates of complete involution in our study are related to the shorter duration of follow-up. Children with unilateral MCDK suffer long-term morbidities regardless of the associated other renal abnormalities. In addition, given the low incidence of clinically significant VUR and the risks associated with VCUG screening, routine VCUG is not advocated in patients with MCDK. Our results should inform counseling of parents of affected infants. Gordon AC, Thomas DF, Arthur RJ, Irving HC. Multicystic dysplastic kidney: Is nephrectomy still appropriate? J Urol 1988;140:1231-4. Cambio AJ, Evans CP, Kurzrock EA. Non-surgical management of multicystic dysplastic kidney. BJU Int 2008;101:804-8. Eickmeyer AB, Casanova NF, He C, Smith EA, Wan J, Bloom DA, et al. The natural history of the multicystic dysplastic kidney – Is limited follow-up warranted? J Pediatr Urol 2014;10:655-61. Schreuder MF, Westland R, van Wijk JA. Unilateral multicystic dysplastic kidney: A meta-analysis of observational studies on the incidence, associated urinary tract malformations and the contralateral kidney. Nephrol Dial Transplant 2009;24:1810-8. Hollowell JG, Kogan BA. How much imaging is necessary in patients with multicystic dysplastic kidneys? J Urol 2011;186:785-6. Mansoor O, Chandar J, Rodriguez MM, Abitbol CL, Seeherunvong W, Freundlich M, et al. Long-term risk of chronic kidney disease in unilateral multicystic dysplastic kidney. Pediatr Nephrol 2011;26:597-603. Aslam M, Watson AR; Trent & Anglia MCDK Study Group. Unilateral multicystic dysplastic kidney: Long term outcomes. Arch Dis Child 2006;91:820-3. Wacksman J, Phipps L. Report of the multicystic kidney registry: Preliminary findings. J Urol 1993;150:1870-2. Kaneyama K, Yamataka A, Satake S, Yanai T, Lane GJ, Kaneko K, et al. Associated urologic anomalies in children with solitary kidney. J Pediatr Surg 2004;39:85-7. Kuwertz-Broeking E, Brinkmann OA, Von Lengerke HJ, Sciuk J, Fruend S, Bulla M, et al. Unilateral multicystic dysplastic kidney: Experience in children. BJU Int 2004;93:388-92. Miller DC, Rumohr JA, Dunn RL, Bloom DA, Park JM. What is the fate of the refluxing contralateral kidney in children with multicystic dysplastic kidney? J Urol 2004;172:1630-4. Onal B, Kogan BA. Natural history of patients with multicystic dysplastic kidney-what followup is needed? J Urol 2006;176:1607-11. Singh JK, Kanojia RP, Narasimhan KL. Multicystic dysplastic kidney in children – A need for conservative and long term approach. Indian J Pediatr 2009;76:809-12. Kiyak A, Yilmaz A, Turhan P, Sander S, Aydin G, Aydogan G, et al. Unilateral multicystic dysplastic kidney: Single-center experience. Pediatr Nephrol 2009;24:99-104. Abidari JM, Park KH, Kennedy WA, Shortliffe LD. Serial followup of the contralateral renal size in children with multicystic dysplastic kidney. J Urol 2002;168:1821-5. Sarhan OM, Alghanbar M, Alsulaihim A, Alharbi B, Alotay A, Nakshabandi Z, et al. Multicystic dysplastic kidney: Impact of imaging modality selection on the initial management and prognosis. J Pediatr Urol 2014;10:645-9. Moralıoğlu S, Celayir AC, Bosnalı O, Pektaş OZ, Bulut IK. Single center experience in patients with unilateral multicystic dysplastic kidney. J Pediatr Urol 2014;10:763-8. Rabelo EA, Oliveira EA, Diniz JS, Silva JM, Filgueiras MT, Pezzuti IL, et al. Natural history of multicystic kidney conservatively managed: A prospective study. Pediatr Nephrol 2004;19:1102-7.